Kristen Spolyar goes up for a shot during a game this season. Spolyar posted a team-high 18 points against Xavier on Feb. 8. Jimmy Lafakis/Collegian file photo. 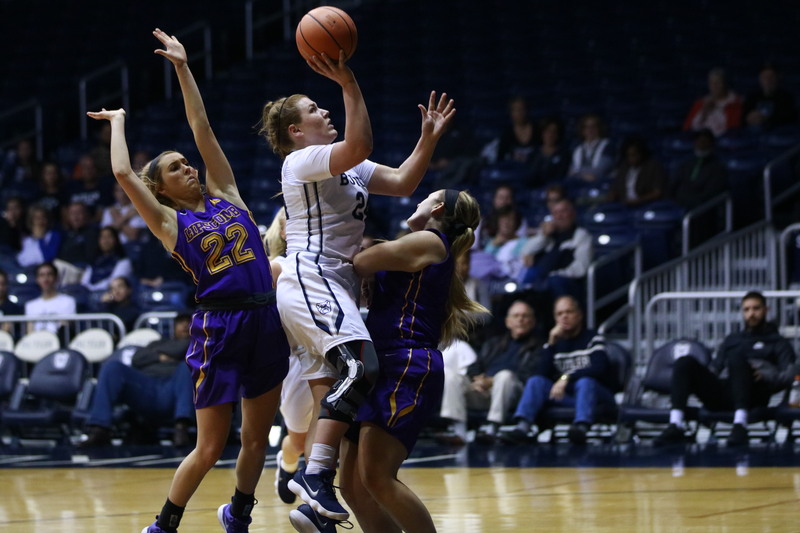 The Butler women’s basketball team defeated Xavier 63-38 at home on Feb. 8, winning every quarter along the way. Butler moved to 18-5 overall and 8-4 in Big East play, while Xavier is now 11-12 and 2-10. The Bulldogs excelled at drawing fouls and finishing their attempts, shooting 10-of-13 on free throws. The opposite was true for the Musketeers, who took only two free throws in the game, making one. Whitney Jennings hit all three of her free-throw attempts on her way to nine points. Shae Brey scored a career-high 13 points on 5-of-6 shooting from the field and grabbed seven rebounds. Butler also flashed its 3-point shooting prowess. Despite shooting 5-of-16 from the field overall, Kristen Spolyar scored 18 points, as all her field goal tallies were 3-pointers. She also snagged five steals in the contest. Michelle Weaver put in an all-around game, dishing out six assists and grabbing three steals. Tori Schickel also added three steals and nine rebounds. Butler won the first quarter 19-8, the second quarter 15-11, the third quarter 18-11. The Bulldogs then shut the door on the game, winning the final quarter 11-8. Butler continues its homestand on Friday, February 15 against Creighton. Tipoff is slated for 7 p.m.